We welcome landscape contractors, nurseries, and municipalities to pick up orders at our wholesale office in Brenham, Texas . . . by appointment only. There is no minimum order for pick-ups. We do ask that you call in your order in at least 3 hours before your arrival, so your purchase can be pulled and ready for you upon your arrival. 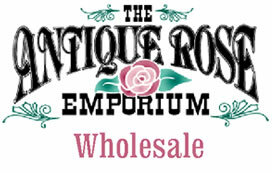 Upon acceptance of plant material, liability by Antique Rose Emporium ceases and the purchaser assumes the responsibilities of our product.